See scan - perfect condition with genuine patination for this set of antique Turkish silverwear. 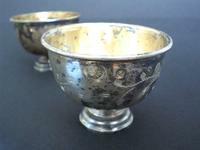 This is a nice pair of Ottoman Turkey sterling silver coffee cups both marked with Sultan tughras and maker's marks. The old tughra marks appear to be from as early as 1820-8130. Cups are about 42mm high and 55mm in diameter and inside still has most of its gold plating / gilt residue. Outside of each cup is nicely hand engraved with flower motifs. Nice antique silver collector set and some of the rare antique Turkish cups.